The survey researched the influencing factors for disabled people when they are away from home- particularly their ability to find somewhere suitable to ‘go’. 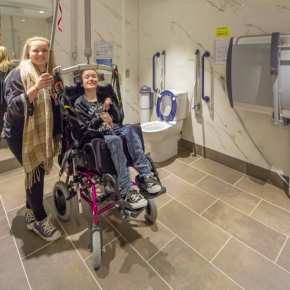 For many people who are disabled, the Regulatory (Document M type) wheelchair-accessible toilet is not sufficient due to the lack of space, appropriate fixtures and fittings, meaning it isn’t suitable for carers to transfer them safely or that it isn’t hygienic enough. With 69% of respondents claiming that where they go is usually or always influenced by toilet suitability and 87% claiming to have left somewhere early because of lack of suitable toilets, this demonstrates the importance of appropriate facilities. In addition, 52% claimed that a lack of space was the biggest issue and 23% stated the need for lifting equipment (e.g. a hoist) as the main problem, and finally, for 24% the issue was the need for somewhere to be changed (such as an adult-sized changing bench). Under Building Regulations and British Standards, a Changing Places should be provided in any facilities to which numbers of the public have access, and/or spend a length of time. It should be in addition to any wheelchair-accessible toilets, and, as a minimum, be 12m2, with a ceiling track hoist, peninsular toilet and adult-sized height adjustable changing bed. Space to Change is a concept developed by campaigners for Changing Places in conjunction with Closomat, and is a compromise based on the Regulatory unisex wheelchair-accessible toilet. It extends that facility by a few m2 to give a total 7.5m2 minimum, with a hoist and adult-sized changing bench.